The D-3 HoH’SuS class of light cruiser was the third generation of medium range combat cruiser to be assigned the designation of D-3. The previous D-3, which was officially struck from the fleet in 2215, bears little resemblance the the most recent D-3 – with good reason. The HoH’SuS was launched in late 2241 with the intention of becoming the Empires premier combat platform. Unlike a number of other vessels of the period, the D-3 became a somewhat popular design and was put into mass production thanks to the influence of Drell and Korath, two of the major shipbuilding houses of the empire. The D-3 HoH’SuS followed in it’s predecessor’s footsteps as a lightly crewed attack platform. Armed with four main disruptors, the D-3 also retained the first generation of the KP-1 torpedo. 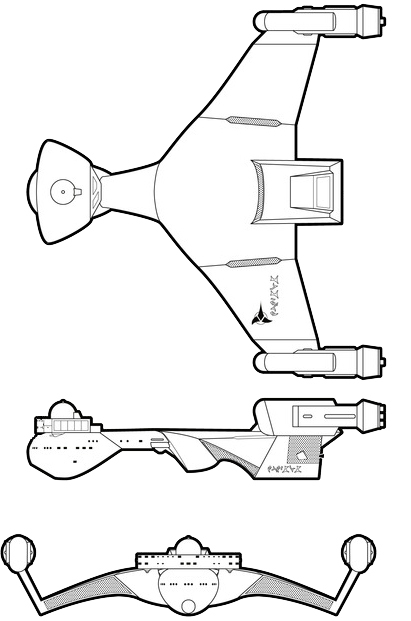 While not the most powerful of the Klingon Torpedoes, the KP-1 was a significant improvement in targeting and flight control over older models, many of which were severely limited in range. The KP-1 gave the D-3 a powerful short range first strike capability that proved vital in the empires struggles with the Kinshaya. The D-3 saw extensive action in the waning years of the open warfare along that boarder, where its’ firepower helped turn the tide in the conflict. The D-3a was produced in large numbers, but was soon overshadowed by a number of other designs, including the D-4 and D-6 cruisers. In 2247, the decision was made to produce an upgraded version of the D-3, with the D-3b launched the following year. The D-3b saw the improvement of the main disruptors as well as the replacement of the primary torpedo with the improved KP-2. With it’s enlarged impulse drive, the D-3b was considered a well rounded design. Despite the improvements, the significant increase in costs to construct the D-3b soon brought the design in contention with a wide range of other designs of the period. The design suffered a further blow when it was determined that updating the D-3a would prove too difficult to be completed in a timely manner. Production of the D-3b was begun in earnest as many realized that the next major conflict for the empire – what would be known as the Four-Years War – was just on the horizon. Both the D-3a and D-3b were utalized during the early part of the war, even as conversions of the “A” model was underway. During the early part of the conflict, the D-3b, along with a vast number of it’s counterparts, proved vital in the early conquests of the Empire. The D-3b was still under-gunned when compared to it’s Federation contemporarys, but was effective in small squadrons and as a support vessel in use with D-6 and D-7’s of the period. As the war dragged on and the Federation began to take back territory lost to the Empire, many became increasingly frustrated with the abilities of the D-3 and a wide range of other front line vessels. In late 2254, House Korath proposed an update to the D-3. Desperate for new and more effective combat vessels, the High Council approved the D-3c and rushed the small ship into production. Unlink the D-3a, the D-3b was able to be updated easily to the “C” model. Despite having higher firepower than the larger D-7a, the D-3c, like it’s previous models, suffered from the heavy automation and light crew. Vessels damaged in battle did not have the massive crew or repair capability of the larger D-7. Most D-3’s damaged in battle were forced to retire from combat – often permanently. By the end of 2256, the D-3 was considered less effective than the new D-7c. By 2262, the D-3 was scheduled for removal from production with the last main hull launched in 2263. The D-3c remained in service until 2280, serving against the Romulans and again against the Federation during the Orgainian conflict. Of the 524 D-3’s built, 201 A’s, 78 B’s and 10 C’s were destroyed. 7 A’s, 6 B’s and 2 C’s are listed as missing with indications that most defected to the IKS. 19 A’s 9 B’s and 2 C’s were scrapped, all after combat. 12 have been captured (5 A’s 1 B and 3 C’s by Star Fleet, 1 A and 1 B by Romulans and 1 C by interests in the Triangle). 85 have been sold to a wide range of interests, including the Nausiccans, Bolians, Orions, Ferengi and several governments in the Triangle. 50 A’s were disarmed and traded to the Romulans. 10 D-3c’s are in reserve fleets. 12 A’s, 10 B’s and 11 C’s are in service to Ranking Families in the Empire. Power Units Available – 14 ea. 14 ea. 18 ea.